On the fourth day of the L.A. teachers strike, a crowd of about 100 students, UTLA members, teachers, and parents, rallied at Arleta at 7:30 a.m. for a news conference. Supporters from neighboring schools like Beachy and O’Melveny were also there. 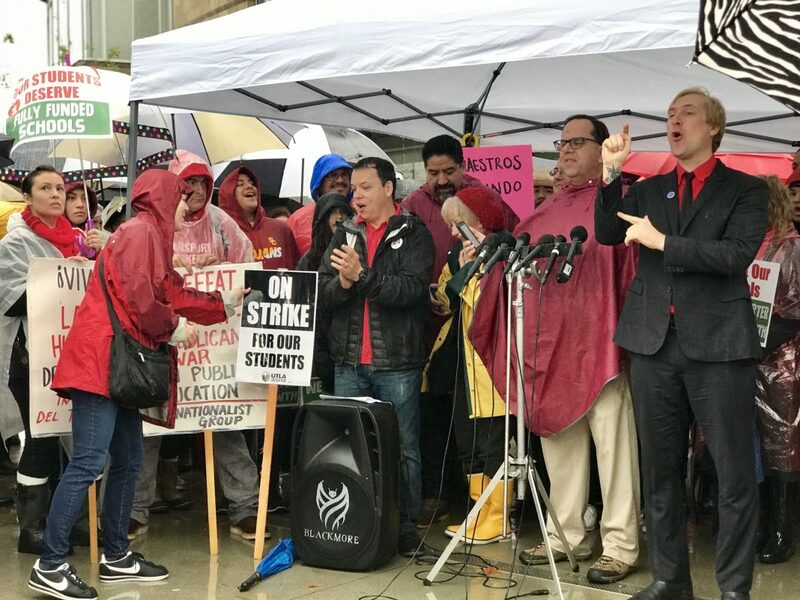 Students, educators, and the president of the L.A.’s teachers union took the mic to repeat the reasons they continue to strike–rain or shine–and the concerns that they hope are addressed in the coming days. “We’re fighting for the things we need in our schools and inside of our classrooms as well as outside of our classrooms because students have a lot of needs. If their needs are not met mentally or emotionally, then they can’t learn,” Perez-Roman said. Earlier in the morning, during the first portion of UTLA’s news conference, he recalled times he had to use money out of his own pocket to pay for simple supplies like tissues or bandages for his students. “That’s why we’re asking for more counselors at each school site; we’re asking for more nurses; we’re asking for class sizes to be reduced so we can actually get more meaningful [interaction] and rigorous curriculums for our students,” he added. Students who spoke during the rally also voiced concern over large class sizes, and about the lack of academic and psychological counseling. “Class sizes are too big, my teachers are often overwhelmed and sometimes us students don’t get the attention we need,” said Marleny Ramos, a sophomore at Arleta High. Justin Polk, a music teacher at Arleta, has been at the LAUSD for just a year but feels strongly about standing in solidarity with fellow teachers. After a long day Thursday, negotiations between the district and the union are set to resume this morning, and a big rally is in full swing in Grand Park. The Los Angeles Times reports that there are signs that a deal could be struck sooner than later, but the union won’t back down, even if it means another week on the picket lines. “We can’t show one iota of relenting,” Caputo-Pearl said. Previous articleWhat Happens After Marie Kondo Leaves? Next articleWhat’s Really Behind Grindr’s Sudden Slash of Its News Site INTO?